C9 includes a facility which allows you to embed fiche data from other c9 dealers. 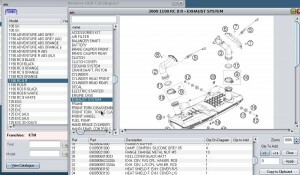 C9 dealer websites allow you to shop online and search fiche diagrams for dozens of manufacturers. But instead of having to toggle between your web browser and c9 to view Bolton KTM parts diagrams for example, you can have Bolton KTM diagrams accessed within your c9. It is as though c9 is a specialised, integrated web browser for fiche diagrams. Get a price file for the franchise via normal price file sourcing methods. 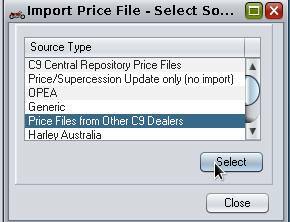 If you cannot easily get a price file you can import retail price file then you can get the retail pricing from another c9 dealer. Spares -> Utilities -> import price file. Select the new franchise. and select option 'From another c9 dealer'. Type in name of franchise into search and select franchise to import. 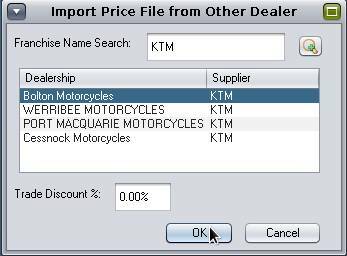 You don't have to use the same dealer for price file you use for diagrams in the next step. They can be different. Now. Goto Fiche icon at the top of c9. (The icon just right of Spares). Then click on the button 'select franchise', to choose your franchise you want to get diagrams for. 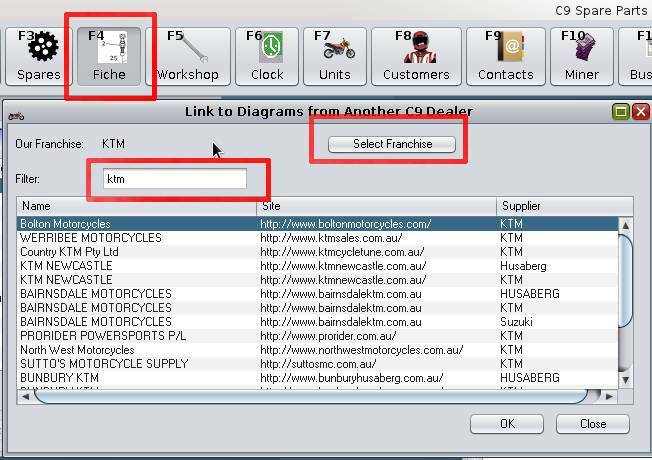 Then type in the name of the franchise in filter to narrow down on dealers that have does diagrams on their website. Select your preferred dealer and then click OK and confirm your mapping selection. You now have diagrams in your c9.